A last-gasp equaliser by Lewis Nightingale ensured Bamber Bridge finished the regular NPL First Division North season on the right note against visitors Atherton Collieries in a 1-1 draw. Adam Farrell put Collieries ahead six minutes before the break but Nightingale levelled in the 88th minute. 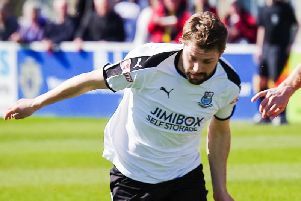 It meant Neil Reynolds’ side secured a fourth-place finish and will head into Tuesday’s play-off semi-final at home to Tadcaster Albion in good spirits. Elsewhere in the division, Ross Dent scored both Clitheroe goals as the hosts drew 2-2 with Skelmersdale United. Kendal Town were well beaten 4-0 at Trafford. In the NPL Premier Division, Lancaster went down 2-0 at Witton Albion, Steve Tames netting both goals. In the National League, AFC Fylde secured their place in the play-offs following a goalless draw at Wrexham. Southport’s season finished with a 2-1 defeat at the Brewery Field leaving them in 15th place in the National League North table. The Sandgrounders opened the scoring in the ninth minute when Ross Hannah, on loan from Chester, slotted David Morgan’s pass past Daniel Lawson for his second goal in three days. But the play-off chasing Moors levelled through Mark Anderson in the 56th minute. And Robert Ramshaw’s curling shot nine minutes later gave them the victory and left Southport with just one win in the last nine games. And in the NWCL Premier, Charnock Richard lost 2-1 at 1874 Northwich, Carl Grimshaw getting their consolation goal. Hosts Burscough beat Abbey Hey 3-2.